Introduced as the Middle East’s new soul diva, many in the audience may have been perplexed about what they are about hear from Ester Rada. The music is cross cultural as well as being a mix of various generations of music. Ester is Israeli born with a complex Ethiopian heritage and her music is described as a mix of Ethio-Jazz, funk, soul and R&B. Inspired by the greats of Nina Simone, Ella Fitzgerald and Aretha Franklin, the music also embraces the contemporary style of Eryka Badu and Lauren Hill. The genre-mix of music, although probably complex in its writing, felt comfortable and flowed nicely across the lush Botanic Park. There was some enjoyable powerful soul diva touches showing the Aretha Franklin et al influences, as well as more laid back jazz. The majority of the set included original music from her 2013 EP Life Happens, and her self-titled 2014 album. Also played was music from her 2015 EP I Wish, which includes the upbeat arrangement of Feeling Good made famous by Nina Simone, which sounded fantastic tonight. Ester Rada was supported on stage by keys, bass, drums, trombone and saxophone who were all dressed in black with Ester then shining in her baby blue high pant and top out front. The first few songs seemed to not hit the mark, I believe possibly due to sound issues, but once rectified, this was a great set to witness. 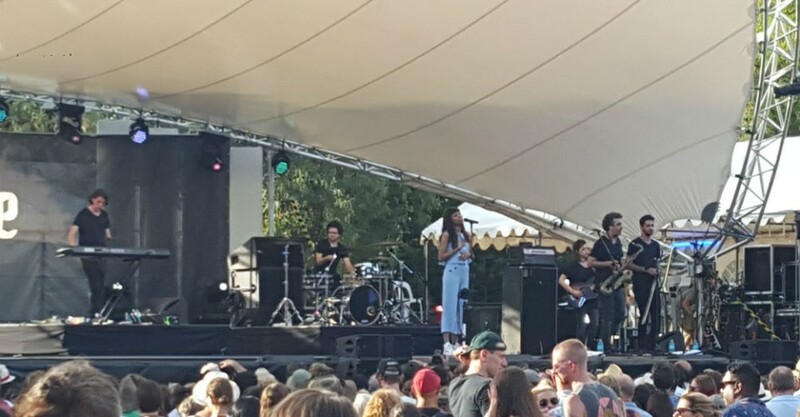 Just like South Australian during the festival season, Ester Rada was a brilliant blend.